The first member of Audi's forthcoming wave of electric cars is expected to start landing in European driveways this fall, possibly neck and neck with the Jaguar I-Pace. The all-electric Audi e-tron SUV will have dimensions similar to the Audi Q5 SUV and should offer enough charge from its 95-kilowatt-hour battery pack to drive roughly 300 miles. Is this the Tesla Model X competitor we've all been waiting for? 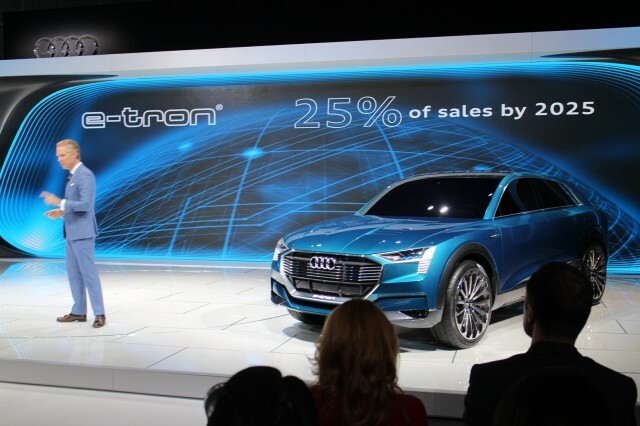 According to AutoExpress, the e-tron is just one of eight new SUVs Audi will bring to market over the next few years. It's also one of at least three battery-electric vehicles the German luxury maker has announced. It will be followed by a sleeker "four-door coupe SUV" version and a compact five-door electric hatchback. In addition to bringing some zero-emission motoring to Audi's lineup, the e-tron is expected to offer Level 3 autonomous features and an updated version of Audi's Virtual Cockpit digital instrument display. Audi will build the e-tron at a plant in Brussels for worldwide markets, including the United States and China. Volkswagen's luxury brand pledged more than two years ago it would sell 25 percent of its cars with plug-in electric capabilities by 2025. The e-tron will precede the two other electric vehicles from Audi to market, with all three models expected to arrive by 2020. After the e-tron, the compact electric hatchback will be based on the same platform as the Volkswagen ID Concept to take on the BMW i3, just as the Audi A3 shares underpinnings with the Volkswagen Golf. 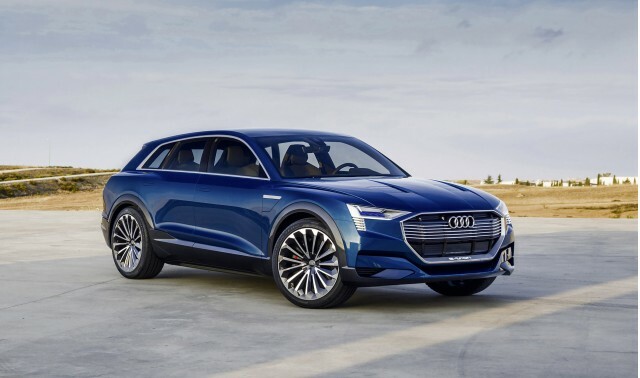 Analysts expect the e-tron to produce nearly 500 hp and 590 lb-ft of torque to take on the Tesla Model X.
Tesla's SUV offers a range of battery capacities, too, and it's rumored Audi may employ the same strategy for the e-tron. Estimates give the Audi e-tron a sprint time of 4.5 seconds to 62 mph, but don't be surprised if Audi is working on a way to wring even more power out of the coming model's battery and three electric motors.